Gluten Free Dairy Free Sweet Potato and Pecan Muffins are a delicious start to your day. These are soft and tender with just the right amount of cinnamon. You can use canned sweet potato puree or bake and mash your own. My favorite way to make these is to roast the sweet potatoes whole then allow to cool. After they have cooled, remove the peels and mash until completely smooth, blending if needed. You can also use half packed brown sugar for the sugar for a more caramel flavor, but expect a deeper brown color to the finished muffins. Enjoy! Printer friendly recipe cards for multiple batches of Sweet Potato Muffin to put extra in the freezer for another day. Printable labels I made for putting on the freezer bags for Sweet Potato Muffins. Thought you would like them, too! Preheat oven to 350 degrees F. Grease bread pan or line muffin cups with cupcake liners. In a mixing bowl of a stand mixer, beat sugar, oil and eggs until well combined. Add sweet potato puree and vanilla and blend well. In a separate bowl, whisk together the rest of the ingredients. Add the dry ingredients into the wet mixture and mix until just combined. Scrape down sided of bowl and mix again. Pour the batter into prepared baking pan. Bake in a pre-heated oven 55-60 minutes for 8x4½ bread pan, or 35-40 minutes for muffins, or until a wooden pick inserted into the center emerges clean. If desired, sprinkle with finely chopped toasted pecans or walnuts prior to baking. 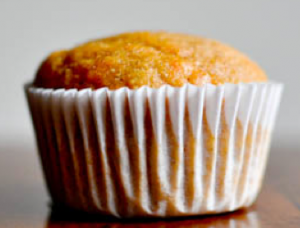 To freeze extra muffins: After muffins are cooled, store in a freezer container or freezer bag, removing as much air as possible, seal, label and freezer. To serve, thaw muffin before eating.